We can accommodate the largest tractor/trailer rigs, 5th wheels, livestock trucks and pickups at our facility located in Greencastle, Pennsylvania. 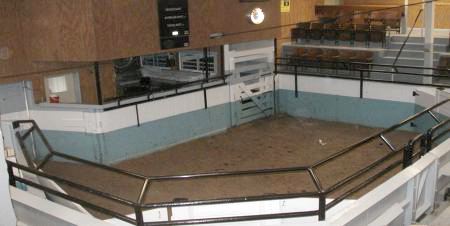 Our main auction ring can accommodate any type of livestock, from the largest of bulls to the smallest of goats. We have a spacious gallery, with an adjoining restaurant. All our auctions are conducted indoors, year round, in a climate controlled environment. Our state-of-the-art electronic scales ensure that you get the most from every dollar bid on every animal that we auction. With automated bid tracking computers, our staff works extra hard to insure that sellers receive their funds expeditiously with utmost accuracy. Visit us and find out why we are the number one livestock auction serving the needs of South Central Pennsylvania, Maryland, Virginia, West Virginia and the neighboring area. We excel in the auctioning of small animals, poultry and produce every Wednesday night. Our calf pens are well-bedded and roomy. Each pen holds up to 30 calves and we never over-crowd them. 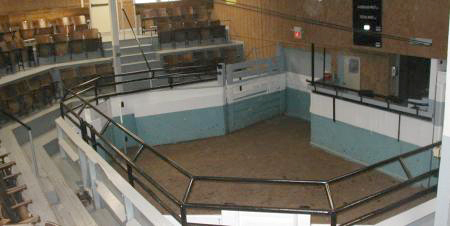 Our calf action ring can accommodate over 30 buyers, sellers and spectators in climate controlled comfort, and is located apart from the main auction ring.